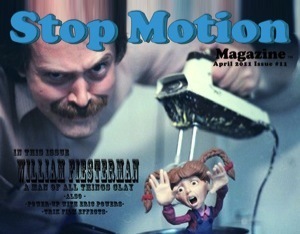 Stop Motion Magazine: Issue#11 April 2011 Available Now!!! Issue#11 April 2011 Available Now!!! Back to the Issue at hand. This issue (I mean the April 2011 Issue) has tons of great stuff in it and a very awesome interview with William Fiesterman. The guy is such a wealth of knowledge and experience. I really think he should have a memoir written. I also would like to take the time to thank Don Carlson for a great beginners tutorial for lighting Clay Animation. We hope to keep Don around to write some more articles for us and not just tutorials. He's a fun guy to have around and we appreciate his contribution to the magazine. There's much much more in the issue and instead of you reading this Blog Entry, I'll let you go so you can get to reading the latest issue. Oh Yeah! Stop Motion Magazine is taking submissions for the 2011 Stop Mo Film Festival. So tell your friends!!! Exciting! Keep up the great work! Thanks, John. I like to write and get more enthusiasm from far-flung people into the craft. People from all walks of life and countries all over the world can appreciate and do stop motion more easily and cost-effectively than ever before at any time in history. Thanks to the digital revolution, stop-mo is more viable than ever- no reason our numbers should shrink. If enough people believe in this technique maybe it will cause even computer animation stalwarts to raise their eyebrows and open their minds a little. I actually kind of wish I knew Spanish so I could better communicate with my new friends in Mexico and Colombia- where, I think, some of the most imaginative clay animation this side of England is being produced. I'm very excited about the films, commercials, documentaries, and behind the scenes vignettes we'll see in the years to come. Thank you, for your part in making it all happen. The fact that this is not only the first, but the ONLY periodical ever published on the art and technical aspects of stop motion says a lot about your passion and childlike enthusiasm for the art form. Given the amount of attention the magazine has drawn in the short time it has existed, that passion is clearly infectious!